Background: While hepatocyte growth factor (HGF) is known to exert cell growth, migration and morphogenic effects in various organs, recent studies suggest that HGF may also play a role in synaptic maintenance and cerebrovascular integrity. Although increased levels of HGF have been reported in brain and cerebrospinal fluid (CSF) samples of patients with Alzheimer's disease (AD), it is unclear whether peripheral HGF may be associated with cerebrovascular disease (CeVD) and dementia. In this study, we examined the association of baseline serum HGF with neuroimaging markers of CeVD in a cohort of pre-dementia (cognitive impaired no dementia, CIND) and AD patients. Methods: Serum samples from aged, Non-cognitively impaired (NCI) controls, CIND and AD subjects were measured for HGF levels. CeVD (cortical infarcts, microinfarcts, lacunes, white matter hyperintensities (WMH) and microbleeds) were assessed by magnetic resonance imaging (MRI). Results: After controlling for covariates, higher levels of HGF were associated with both CIND and AD. Among the different CeVD MRI markers in CIND and AD, only small vessel disease, but not large vessel disease markers were associated with higher HGF levels. 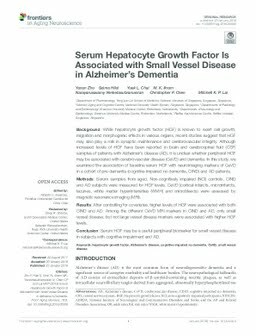 Conclusion: Serum HGF may be a useful peripheral biomarker for small vessel disease in subjects with cognitive impairment and AD.